Reprinted from the Internet Poetry Archive sponsored by the University of North Carolina Press. For educational use only. 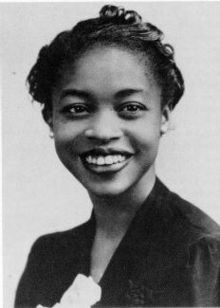 Margaret Walker (1915 – 1998) was an American poet and writer born in Birmingham, Alabama. She was part of the African-American literary movement in Chicago. Her notable works include the award-winning poem For My People (1942) and the novel Jubilee (1966), set in the South during the American Civil War. This entry was posted on September 30, 2016 by Vox Populi in Opinion Leaders, Poetry, Social Justice and tagged African American poetry, Dark Blood, Margaret Walker:.